Metal Sales Manufacturing Corp. recently provided more than 81,000 square feet of metal roof and wall panels for the snow removal equipment building at Spokane International Airport in Washington. The 50,800-square-foot snow removal equipment building includes nine equipment bays, a five-ton bridge crane and a washing station for eight new 75-foot-long snow removal trucks. 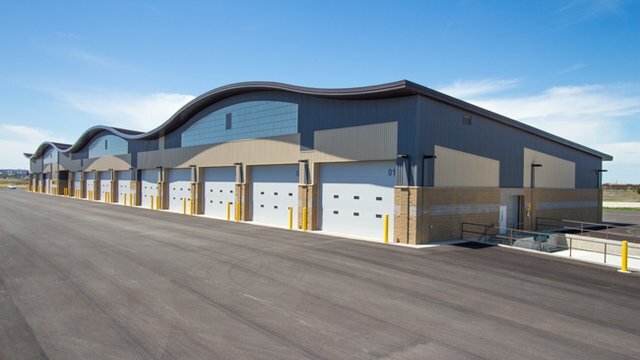 Adding to the function of the building, the aesthetic is more than that of a typical storage and maintenance facility, according to a Metal Sales release. The look is sleek with clean lines, and topping the structure is a wave-like roof that looks like a ribbon in the wind. The roof’s design mimics the rolling hills of the surrounding landscape and its flow is symbolic of the movement of travel. The design team had four goals when designing the facility: meet current FAA airfield snow and ice clearance requirements, provide storage and maintenance space for new snow removal equipment, achieve LEED certification and use products that will withstand the Spokane weather conditions for several decades. To achieve these goals, the team chose to use metal roof and wall panels from Metal Sales. More than 56,000 square feet of Metal Sales 16-inch Magna-Loc standing seam roof panels with striations in a dark bronze finish, 18,400 square feet of IC72 wall panels in slate grey and khaki and 6,300 square feet of soffit panels in dark bronze outfit the facility. All Metal Sales panels have a life span of 50 years or more, are 100 percent recyclable and contain a high percentage of recycled material, contributing to sustainable building goals, such as LEED. All panel colors from Metal Sales are Energy Star listed and can improve the energy efficiency of a building. The building has earned LEED gold certification.